"Can you please sound out this word, hon?" I asked. She squirmed visibly on the couch. I squirmed invisibly on the inside. Her reading book sat between us, my finger poised underneath a word, and my eyes staring down at the page, assuming she was doing the same. But when I I glanced in her direction, her eyes were fixed on the ceiling above her. "Mommy," she started. "How about I count the words, first?" "No hon. Just read them." Well, can I see the other pictures then? Can I do a different easy lesson? Maybe we can take a break? Can I have some water first? How about we alternate words? Can I please count all the words on the page first? The requests kept coming. My little "queen of distractions" was working very hard at avoiding hard work. If I hadn't been so impatient, I probably would have laughed at the irony of it all. This whole thing should have taken 20 minutes. We were well past 20 and not even halfway through. Didn't she realized that if she would just buckle down and read the words, she could move on with her day? "Sweetheart, I know this is hard. But the more distracted you are, the longer it takes. If you just read the words, we can be done sooner!" It's not that she can't do it. My little girl is very smart, very capable, and very motivated on her own terms. She just doesn't like hard work. She'd rather talk about the work, than do the work. She'd rather dance around the work, than dive into the work. I'm afraid to say that I'm probably more like her than I'd care to admit. I often feel busy with "things," but what I'm really doing is just dancing around the actual hard work. I make lists. And then I make lists of my lists. I do all the easy work first and avoid all the hard things. I always talk about the things I need to get done, or plan to do, but often never accomplish them. I begin projects but lack the drive to complete them. I'm full of ideas that are rarely actualized. I'll avoid hard things by checking email. 25 times. There are things that are permanently on my "to-do list," because I'm never able to cross them off. I consider my ridiculous (and hard working) attempts to avoid hard work, and smile slightly at the ridiculousness of it. Unlike us, though, the Proverbs do not treat this pattern lightheartedly. In fact, it speaks of it in jarring terms. When I avoid hard work, I'm actually choosing poverty. I choose poverty because the most important things on my list never actually get accomplished. I choose poverty because I continue in laziness rather than growing in diligence and dependence. I choose poverty because I say that God's glory is not worth my hard work (Colossians 3:23). I choose poverty because those unfinished items remain looming, condemning, and stressful. But it doesn't have to stay this way. We can heed the wisdom of the Proverbs and avoid "mere talk" by working heartily, and in dependence, on the Lord's help. "No unwelcome tasks become any the less unwelcome by putting them off till tomorrow. It is only when they are behind us and done, that we begin to find that there is a sweetness to be tasted afterwards... Accomplished, they are full of blessing, and there is a smile on their faces as they leave us. Undone, they stand threatening and disturbing our tranquility, and hindering our communion with God. If there be lying before you any bit of work from which you shrink, go straight up to it, and do it at once. The only way to get rid of it is to do it." In all things, reading lesson or otherwise, this is what I long to teach my daughter. I hope to encourage and empower her to "do it at once!" for the glory of God. I long for her to relish in the reward of perseverance and hard work. 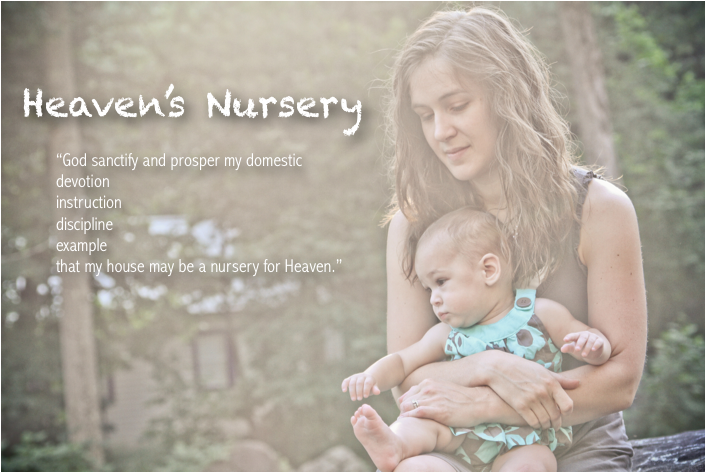 I want to teach her that Jesus Christ embraced the hardest of work -- and finished it -- so that we might work hard for Him. And as I sit down each day with my daily to-do list, this is what I pray that God enables me to do as well -- to face such unwanted, and challenging tasks, with a commitment to love my God and highlight His glory by diligently embracing His to-do list for me. Our hard work for Him proclaims boldly, Thank you Lord, for working for me first.